Windsor First Aid features St Mark James 1st aid and / or Cardiopulmonary resuscitation (CPR) renewal lessons. These kinds of courses are made for participants who need to renew old certs. All the re-certification classes present successful individuals with workplace approved certificates which satisfy or exceed the certification merit of the out of date cert. Our company offers all existing re-cert courses at convenient dates and times as well as the cheapest rates. Registration is completed easily and on-line. This website will outline the featured re-cert courses provided in Windsor via Windsor First Aid. The following re-certification lesson is made for candidates that want to re-certify expiring standard first-aid cards within Windsor. This training course is approximately 8 hours in length and incorporates CPR “C” renewal. Automated external defibrillator certification is also integrated. Renewal cards are good for three years. 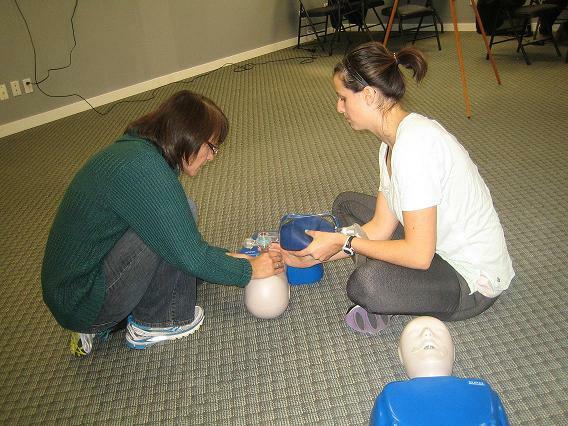 This re-certification class is designed for applicants who need to renew both emergency first-aid and CPR. CPR level “A” is provided standard through this renewal training course, but, participants may opt for Cardiopulmonary resuscitation “C” to opt with this program. Automated external defibrillator (AED) training is provided. This course normally takes 8 hours to complete. This CPR “only” renewal training course targets just on Cardiopulmonary resuscitation and doesn’t include first-aid re-certification. Cardiopulmonary resuscitation level HCP (also known as CPR level “C” for health care providers) re-cert classes are featured in Windsor at a number of locations and different times. View the Cardiopulmonary resuscitation “HCP” re-cert page to find out more or to sign-up. This particular re-cert program is regarded as the most in-demand re-certs offered. This particular class requires around 4 hours to finish and also incorporates AED renewal. Visit the CPR “C” and AED re-cert web page to find out more and / or for registration. Prior to enrolling for any kind of re-certification course applicants need to satisfy a number of workplace approved prerequisites. Proceed to the re-cert program web page of your preference to learn more or to register. All 1st aid and / or Cardiopulmonary resuscitation renewals in Windsor provide valid three year certificates and awards.